Characters from past titles will help build your town. They won’t be transported from their original world, instead they will be shown as though they have always lived in the current locale. Confirmed characters include Ayesha, Klein, Marie, Meruru, Sophie, Vayne, and Veola. Silhouettes hint at Elie, Escha, Judie, Lillie, Logy, and Rorona. They appear as shopkeeps, managing ateliers you construct in your town. 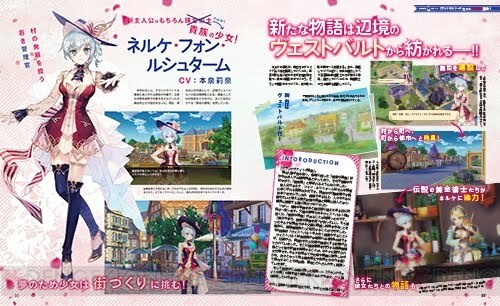 Nelke and the Legendary Alchemists Is currently in development for the PlayStation 4, PS Vita, and Switch. It is expected to have a Japanese release this year. In addition to town-building, there will be gathering, battle, and synthesis elements. There is mention that the town can be built using your own money, so I can only assume this is a free-to-play title. Announced during the PC Gaming Show, an E3 event often missed by those focusing on the big publisher, Sega plans to bring a lot of its catalogue to the PC. Joining previously released titles such as Bayonetta and Vanquish, Sega will introduce PC players to the Yakuza franchise plus bring us Valkyria Chronicles 4. With almost every mainline Yakuza game set to be playable on the PlayStation 4 at some point, PC fans need to not worry about missing out with Yakuza 0 and Yakuza Kiwami announced for the PC during E3. The action-packed titles — following Kazuma Kiryu, who is under the suspicion of murder, and the following 10 years — will be brought to PC players for the first time. The Yakuza games feature 4K resolution support, with further PC optimization and ground work done to both titles to result in uncapped framerates, customisable controls, and ultra-widescreen support. Yakuza 0 will launch on PC on August 1, with the game currently available to preorder. Players will find themselves tempted by a digital manga, digital wallpapers, and avatars. Kiwami, however, doesn’t have a release date announced yet. Besides the Yakuza series, this year’s release Valkyria Chronicles 4 will give tactical RPG fans a solid re-entry to the series for PC players. The last entry in the series on PC was the original. Set in the same time frame as the original, the game focuses on a new set of characters on the continent of Europa where the Second Europan War is fought. This RPG is sure to reunite many to the series with it also releasing on all consoles later this year. Valkyria Chronicles 4 has been locked in for a release later this year, but also with no set-in stone date. Last month, I played The Infectious Madness of Doctor Dekker, a game loosely (yet somehow firmly?) based in Lovecraftian lore. But Call of Cthulhu goes further, delving into the world inspired by Chaosium’s classic pen and paper RPG. It’s 1942 and a private investigator has been sent to Darkwater Island, and isolated place that contains the Hawkins family mansion. The entire family is dead. The local police can’t be trusted, let alone the civilians. Soon enough, the investigator finds himself in the terrifying world constructed by Lovecraft, featuring conspiracies, cultists, and cosmic horrors. Your sanity remains unstable the entire time, as you’ll find yourself (as the inspector) hearing whispers from dark corners and having your other senses disrupted. The cultists want the Great Dreamer to awake, and they don’t want you to stop them. Call of Cthulhu will be released this year on PC, PlayStation 4, and Xbox One. Continuing the mythology behind Super Bomberman R, which redefined the series back to its roots after been dormant for a generation, Hypers Sport R sets to reboot Hyper Sports to the modern era. The series had its start from the Konami release of Track & Field, which later got a sequel in the form of Hyper Sports. Both titles Japanese releases were officially licenced products for the Japanese 1984 Summer Olympics. Hyper Sports R will introduce players to a variety of individual and team-based sports, similar the original release’s line-up. Players will compete in sports such as track and field, beach volleyball, and swimming with a roster of over 20 characters. Konami has revealed the game will feature a campaign mode with an additional quick play four player multiplayer experience. The game will also feature both classic controls with the joy-con and motion controls. While the series gained a few mobile releases and rereleases of the original over the years like Bomberman, Hyper Sports has seen not even a glimmer in the series for a generation. With the series itself lacking major releases since the days of the arcades it will be an interesting title to watch. Konami plans to reveal additional sports and features on the game at a later date, with the release date for the tile to be determined.